Railpictures.ca - Doug Page Photo: The NYC liked its Alcos, owning 44 FA-1s, 23 FB-1s, 80 FA-2s, 50 FB-2s, 23 RS-2s, 135 RS-3s but only 9 RS11s and 25 RS-32s. These engines were largely used on “Lines East” (of Cleveland) and based out of De Witt (Syracuse, NY). 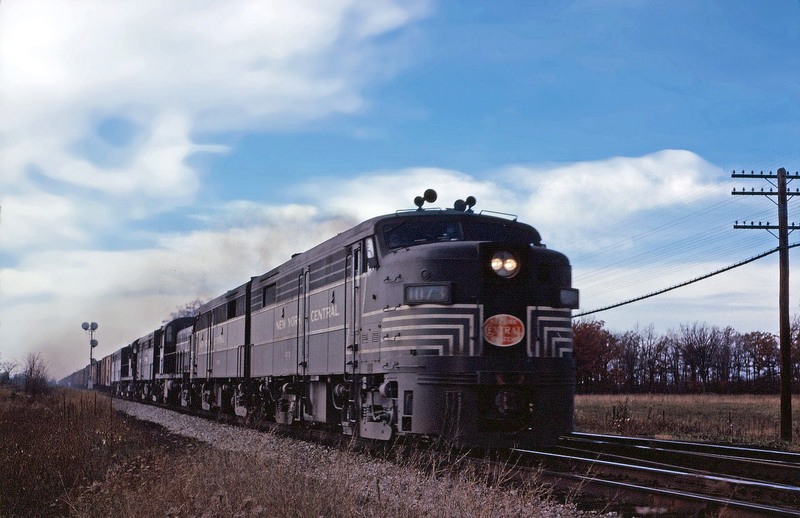 In the early 1960s, NYC began trading in its older Alcos for more modern power–initially the RS-32s and after 1964 on General Electric U25B, U28B, and U30B units. In this photo, we see three FA-2s, an FB-2, an RS2 and either an RS11 or RS32 leading an eastbound through Canfield. | Railpictures.ca – Canadian Railway Photography – photographie ferroviaire Canadienne. Caption: The NYC liked its Alcos, owning 44 FA-1s, 23 FB-1s, 80 FA-2s, 50 FB-2s, 23 RS-2s, 135 RS-3s but only 9 RS11s and 25 RS-32s. These engines were largely used on "Lines East" (of Cleveland) and based out of De Witt (Syracuse, NY). In the early 1960s, NYC began trading in its older Alcos for more modern power--initially the RS-32s and after 1964 on General Electric U25B, U28B, and U30B units. In this photo, we see three FA-2s, an FB-2, an RS2 and either an RS11 or RS32 leading an eastbound through Canfield.